Britain's Mark Cavendish captured his first win of the year after sprinting to victory in stage two of the Tour of Catalunya from Salt to Banyoles. The 24-year-old HTC-Columbia rider, who suffered cuts and bruises during a fall in the Tirreno-Adriatico last week, edged clear on the 182.6km course. Paul Voss of Germany retained the overall lead after winning the first stage, while Cavendish remains seventh. The race is comprised of seven stages and finishes in Catalunya on Sunday. 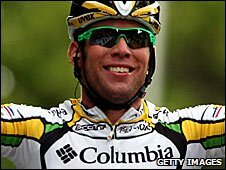 Cavendish won 24 races in 2009, including six stages at the Tour de France, but his last victory came on 8 September. His pre-season preparations were affected this year by illness caused by an infected tooth. "The year began badly and not to have won anything has been frustrating," he said. "I could have won a stage in the Tirreno-Adriatico and then I had bad luck in Milan-San Remo this year. But gradually things have got better and I have got the win. "More than relieved I feel proud to be winning here because it shows the team never lost confidence in me. We've got a young team here in Catalunya and it could have been difficult for them to commit themselves. "Instead of that they gave it 100 per cent, never lost faith in me and that fills me with a sense of pride and gratitude." Team Sky's Italian rider Davide Vigano finished in 15th spot, while team-mate Chris Froome was 37th. "It ended with a bunched sprint and Mark Cavendish won that as he usually does," Team Sky's sporting director Steven de Jongh said on the team's website. "Davide Vigano was our main guy and I think he did a good job. Everything went according to plan, we only have six riders here and two of them are coming back from injury so they have to be careful and just make sure they finish the race. "The rest of the guys did well and hopefully they will do well on Wednesday, although it is a difficult mountain stage." 3. Aitor Galdos (Spain/Euskaltel) "
4. Samuel Dumoulin (France/Cofidis) "
5. Michel Kreder (Netherlands/Garmin) "
6. Manuel Cardoso (Portugal/Footon) "
7. Kristjan Koren (Slovenia/Liquigas) "
8. Nicolas Roche (Ireland/AG2R) "
9. Ryder Hesjedal (Canada/Garmin) "
10. Daniel Moreno (Spain/Omega Pharma-Lotto) "
Who do you think will triumph in the race?